I cannot imagine how anyone came up with the idea of a unicorn. The idea is not new, unicorns have been around for a least a couple of thousand years, and may even predate that. But what was the inspiration? Fair enough, but unicorn stories come from a variety of sources, and they are consistent in themes. The preferred method of capturing a unicorn is by charming them with a nubile virgin. Anything to tame the savage beast I guess. This is where I think the folk stories start to intersect. Beauty and the Beast sounds like a variation on the theme – the savage beast is charmed by the virgin. Unicorns are almost always white and exceptionally spiritual. 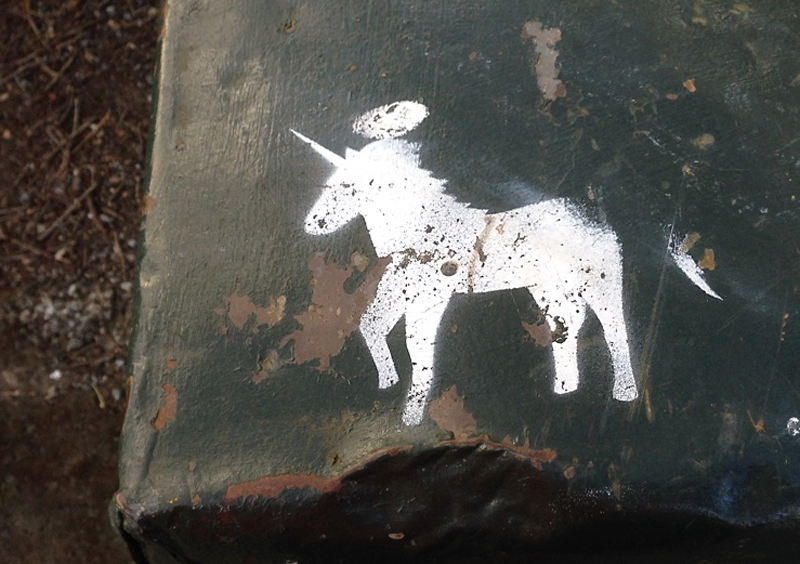 My unicorn today even has a halo. Other than a rhino [not exactly horse-like to look at] it’s unclear what land animal would have a single horn. It is possible to fuse young goat horns together so they are unicorn-like in that respect. But why? What would be the inspiration for this? The best response I can offer to this mystical mystery is this photo of the unicorn and my blessings. 10 Jan This entry was written by Lynsey, posted on January 10, 2017 at 11:39 pm, filed under art, creativity, exploring, fun, graffiti, handcraft, love, photography, public art, seeing, Wellington and tagged art, fairy tales, folklore, fun, horse, inspiration, legends, love, mystical, myth, nofilter, stories, unicorns. Bookmark the permalink. Follow any comments here with the RSS feed for this post. Post a comment or leave a trackback: Trackback URL. Older: Where do you go my lovely?